Printed fairbooks will be available and mailed out after June 1, 2018. Find fairbooks at your local library or the fair office. For Farm Products judging tips, go to www.hort.cornell.edu/gbl/toolshed/vegfare.pdf - please read competition guidelines as changes have been made. SUNDAY, AUGUST 27 FROM 9 A.M. - 2 P.M. AND MONDAY, AUGUST 28 FROM 9 A.M. TO 2 P.M. These are the only times to drop off items for these sections. The remainder of the sections in Fine Arts will be accepted on Tuesday, August 29, 2017 from 12 Noon to 9 p.m. The following Departments have ADDED OR DELETED classes from 2016: Domestic Arts, Flowers, Antiques, Maple, Ponies, Baked Goods, Farm Products, Fine Arts, Antiques, Donkeys and Draft Ponies. All animals need to be in place by Midnight on Wednesday. The Change continues for animal release time: All animals will be released at 8:00 P.M. on Monday. All animals must be out of barns and off fairgrounds by Noon on Tuesday. Again, Added pick-up time on Tuesday evening, as well as Monday evening, for Baked Goods, Culinary, Domestic Arts, Fine Arts, Antiques, Farm Products, Maple, Honey, Fruit, and Wine. CHECK the department rules for times. 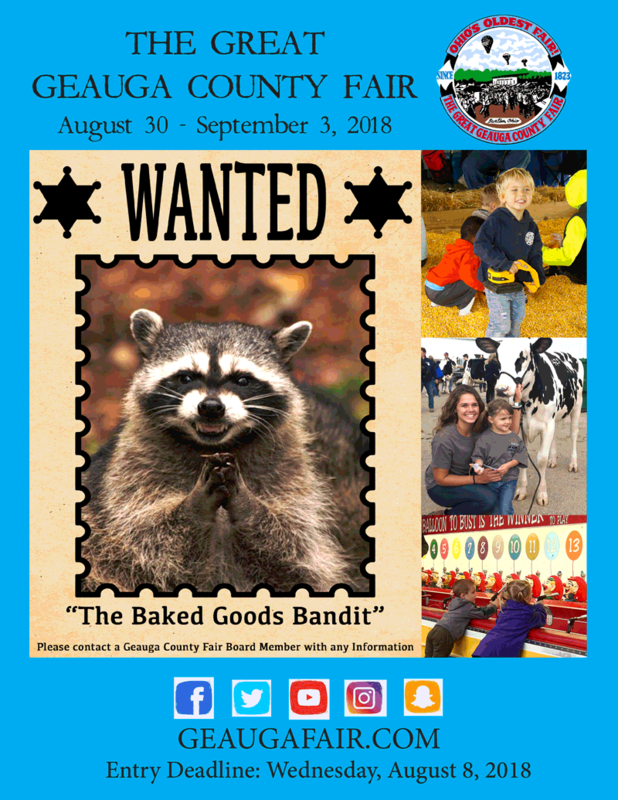 Since 1823, residents of Geauga County and beyond of all ages have been active participants and enthusiastic supporters of the Fair. In 2016, over 13,000 exhibits were entered for judging at the Fair in a variety of competitions and categories including, livestock, horticultural and agricultural products, Fine Arts, Domestic Arts, antiques and collectibles, culinary and baked goods and many more.